After a series of four league matches both the MMKAC men’s and women’s teams qualified for the Eastern Veterans Cup Final being held at Bedford next month. Both teams won at Bedford in the final match, the men were overall league winners with the women placing second in their league. John Browne set a M60 200m league record of 26.2, clipping over a second off the previous best the 4 x200m men’s relay team set a league record of 1.46.3. Steve Hossent ran leg 1, Mark Dowson leg 2, Jeremy Vick, leg 3 and a scorching last leg from Scott Herbert saw the record clipped by 4/10th of a second. Not to be outdone the ladies followed suit as the quartet of Corinne Nurse, Steph Johnson, Chrispina Odunewu and Jan Hardcastle set new figures with a time of 2.07.2. Two other 2km individual league records came from John Skelton (M60) with 6.51.7 and Diane Baldwin(F50) clocking 8.13.1. Elsewhere, four ran in the Dublin Half Marathon where some 8,000 runners finished. 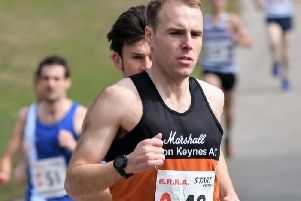 Geoff New placed 460th in 1:37.00 followed by Vanessa and David Stride who finished together in 2:16.18 and then Karen Bugaj completed the team in 2:22.49.